Ivory James' daughter Sochi Special posted the fastest time from 41 two-year-olds who eight training races at Retama Park today (Friday). SELMA, TX�MARCH 4, 2016�Sochi Special, a daughter of multiple stakes sire Ivory James, posted the top mark Friday from 41 two-year-olds who participated in eight training races at Retama Park. Saddled by trainer Leon Bard, the Texas homebred racing for owner/breeder Pamela Stone easily rolled to victory in first two-year-old schooling race (Race 3) while posting a time of :13.85 seconds. Francisco Calderon was aboard the gray filly out of Rc Shake Em Blue, by Royal Shake Em. 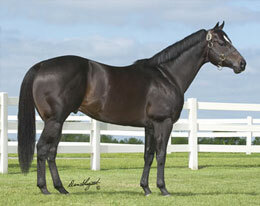 Sochi Special is the third foal of the winner Royal Shake Em mare Rc Shake Em Blue. The second dam is the Special Effort mar Special Jasmine, a half-sister to stakes-placed Dancing Jasmine (TB). For a complete list of today's Retama 2-Year-Old results in order of time CLICK HERE.